I had a help desk case the other day where a customer was reporting a problem when trying to print an InfoPath client application form. 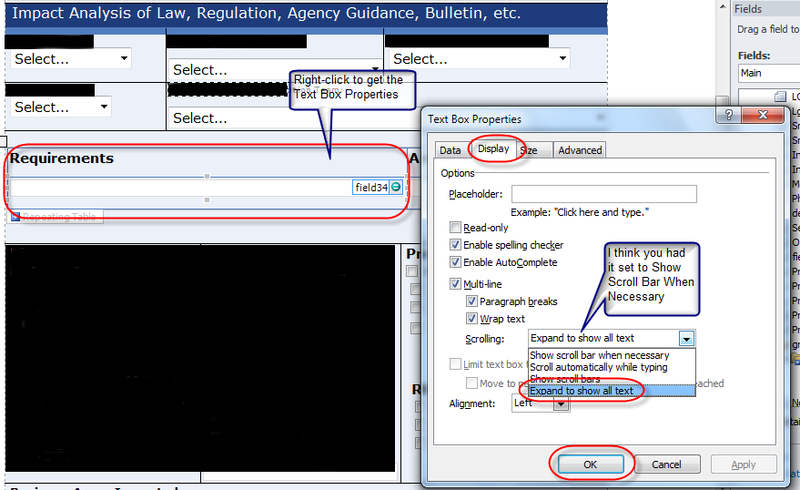 She had created a text box field, but if the text overflowed to another page, it would often be truncated. This sounded vaguely familiar to another problem I ran into some time back, and my SharePoint Buddy had figured out the solution. The Scrolling option on the field had been set to Show Scroll Bar When Necessary. While this works well when the form is displayed on the page, it doesn’t work when the form is printed. It just truncates the text in the box when a page break occurs. To resolve this, all I needed to do was to set the Scrolling option to be Expand To Show All Text. Once that was done, the print spanned page breaks with no issues.